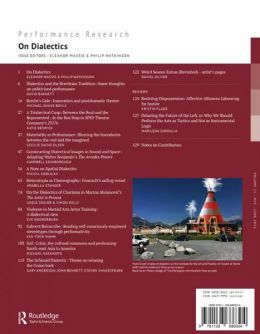 On Dialectics provides a platform for articles, performative essays and artist's pages that focus on the interrelations between dialectics and performance, and a space to reflect on how dialectical methods have been or can be applied in theatre and performance theory and practice. This issue asks how a theory of flux, contradiction and becoming might be particularly vital to the study of the contemporary performance industry in an era of increased global socio-economic instability. When thinking of alternatives to neoliberalism in the sphere of cultural production, why might scholars and practitioners recuperate a praxis that places fracture and antagonism at its very heart? How might the playful and dialogic engagement that dialectics promotes speak to the creation, process and experience of contemporary cultural activity? 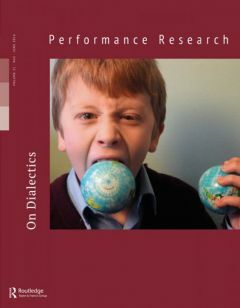 Is performance inherently dialectical, or dialectics inherently performative?